Petersham has taken the food world by storm with some clever food innovation and “first in the world” accolades. Much loved cafe, The Tiny Giant has hit gold with their new coffee in a cone concept, with people coming from as far and wide to try freshly brewed Campos coffee in a chocolate coated wafer cone. Newcomer, Kickin’ Inn, has received an overwhelming reception from it’s “taste the experience” concept, where super fresh seafood is cooked with your choice of seasoning and served so fresh it even comes still wrapped in it’s plastic bag. If you haven’t visited Petersham in a while or just never made it – now is definitely the time. With the Portuguese Food and Wine Fair coming up on March 10th, 10am -6pm, and so much more on offer – you can never have too much on your plate in Petersham. 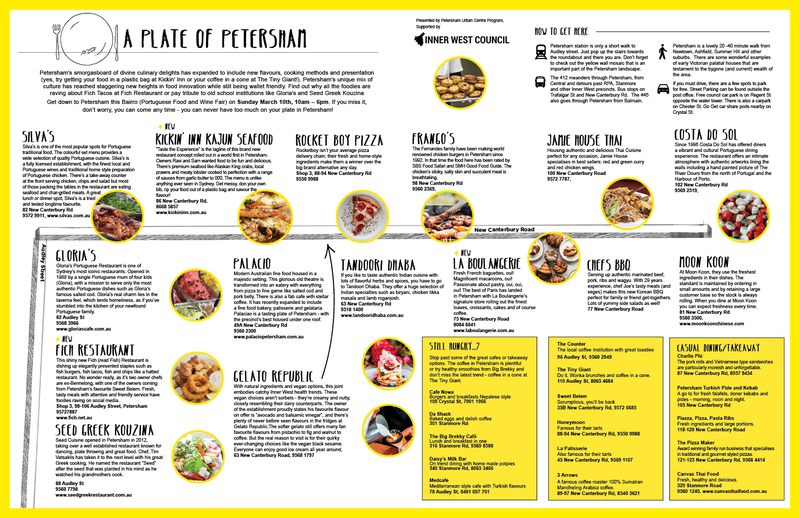 Download the full guide to Petersham here or see below.